Vail’s Heidi Kloser on Sunday finished fifth in the final World Cup moguls qualifying event before next month’s 2014 Winter Olympics in Sochi, Russia, and she’ll find out Tuesday if her performance was good enough to make it to the Games. Vail’s Heidi Kloser on the podium in Lake Placid (Facebook photo). Six American women qualified for the final in Val St. Come, Quebec, on Sunday, and Canada’s Chloe Dufour-Lapointe took the win. Defending 2010 Olympic gold medalist Hannah Kearney, of Norwich, Vt., was the top American in fourth. 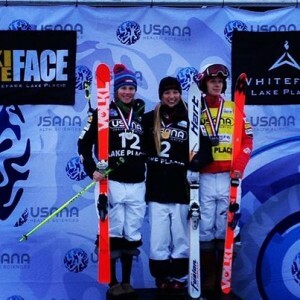 Kloser, a Ski and Snowboard Club Vail athlete, capped off a solid month in which she finished fifth, second and fifth in the last three World Cup events in Deer Valley, Utah, Lake Placid, N.Y., and Sunday’s competition in Quebec. Light snow fell on the course most of the day, making for flat light conditions for the athletes. Sunday closed the Olympic selection period, and official team nominations will be announced Jan. 21.